A total of 10 records matched your search. 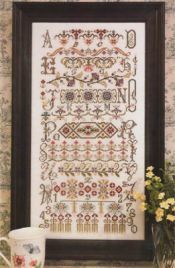 Autumn Quakers from Rosewood Manor is stitched on 14/28ct Doubloon from Picture This Plus with a stitch count of 170w x 270h using Valdani fibers. 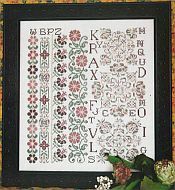 Bucklebury Sampler from Rosewood Manor is stiched on 16/32count Antique White with a stitch count of 158w x 335h using DMC floss. 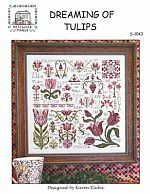 Dreaming of Tulips from Rosewood Manor is stitched on 32count Antique White or a fabric of your choice with a stitch count of 119w x 199h using 8 colors of Weeks Dye Works hand-dyed fibers. Green on Green from Rosewood Manor is stitched on 14/28count Pampas from Picture This Plus with a stitch count of 300w x 158h using 11 skeins of Weeks Dye Works Cadet or fiber of your choice. 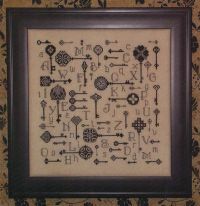 Keys to the Kingdome from Rosewood Manor is stitched on 14/28ct Cream. 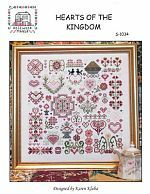 The stitch count is 140w x 140h and uses DMC floss, DMC Light Effects and Mill Hill Beads. 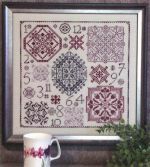 One Dozen Quakers from Rosewood Manor is stitched on 14/28count Platinum with a stitch count of 162w x 162h using 7 Weeks Dye Works hand-dyed fibers. 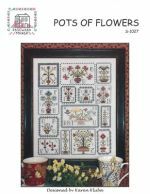 Pots of Flowers from Rosewood Manor is stitched on 16/32 count Antique White with a stitchcount of 196w x 247h using DMC/Anchor floss. 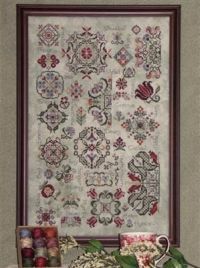 Spring Quakers from Rosewood Manor is stitched on 14 count or 28 count Valor from Picture This Plus with a stitch count of 170w x 270h.This pattern uses Valdani 3 strand Hand-Overdyed color fast floss with the thread collection available from Rosewood Manor.